The dust bowl in America is a catastrophe event occurred in early 1930's. It caused the Midwestern and western farmlands conversion to wastelands. 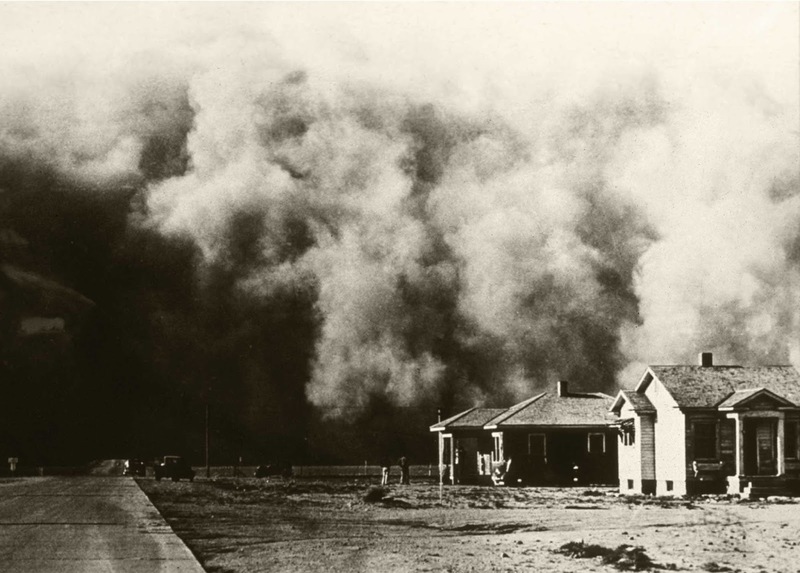 The major reason behind the dust bowl was series of dry years faced in America with vast agricultural practices in unsuitable areas. Poor tillage practices causes the dust storms and droughts that that devastated the farm lands and ranches in Great Plains. This disaster left nothing behind no humans no nutrients and no plants cover. The European settlers arrived in the Great Plains. They build the farms and ranches. Cattle ranching provide the benefit for users but ranching caused the overgrazing and degradation of soil. Farmers plow the natural grass and replace them with their own crop. Row crops caused the damage to soil because the land between the rows is barren and it is exposed to wind so it leads to soil erosion. Precipitation was less in the region. Less rainfall left the soil dry and it was impossible than to cultivate that land again. The dry soil blew with wind and carried the soil dust to 100 of miles. It led to dust storm and dust bowl event. These dust storms buried the roads and buildings under sand. Cover Crops are used to cover when low residue crops are used. Crop Rotation is a good practice. It is the practice in which different types of crops are grown in the same area for many benefits such as to avoid pests and pathogens, to increase the fertility demands. Irrigation is good practice, because wet soil blows less. Extensive efforts were done by both Federal and State Government. Rehabilitation for settlers who are affected. Plantation of clover and alfalfa produce organic matter, nitrogen, and it binds the soil. It also absorbs the rain water. Instructions were given to cattle ranchers to prevent overgrazing.